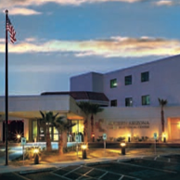 Western Arizona Regional Medical Center (WARMC), a 147-bed, full-service facility, is accredited by the Joint Commission on Accreditation of Healthcare Organizations (JCAHO). From a newly expanded Emergency Department through Home Health and Hospice, WARMC offers more than 27 medical specialties and 87 active physicians on staff. The facility offers a full range of services including 24-hour emergency care, intensive care, medical/surgical care, general and vascular surgery,a cardiac catheterization lab, orthopaedics, gastroenterology, OB/GYN, and urology. For over 22 years, WARMC has been committed to providing quality care to the patients of the tri-state area. Located near the spot where Arizona, Nevada and California meet, Bullhead City is a rapidly growing community nestled along the beautiful blue waters of the Colorado River. The striking scenic beauty provides the backdrop for a host of outdoor recreation activities. The community serves as the economic hub and retail shopping center for Western Mohave County and Southeastern Clark County, Nevada. More than five million people travel through Bullhead City annually to enjoy the wonderful weather and great community atmosphere. Bullhead City is located across the Colorado River from one of the nation's most popular gaming communities: Laughlin, Nevada. The year-round sunshine makes it perfect for families, retirees and vacationers. Bullhead City is truly an oasis in the desert.